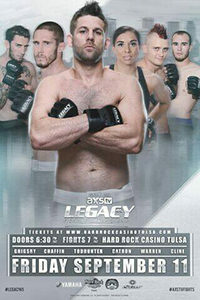 Legacy Fighting Championship returns to the Hard Rock Casino in Tulsa, OK on September 11, for Legacy 45. The main event will be Dylan Smith (10-6) vs Andrew Todhunter (7-0) at catchweight. Todhunter returns to Legacy after briefly being signed to the UFC. Todhunter passed out attempting to make weight on a late notice fight, and was eventually released before making his debut. Ed Kline (8-4-1) returns to Legacy, and will face JC Cottrell (15-3) in the co-main event. Also on the main card, UFC veteran Sean Soriano (8-3), will take on James Warrren (7-2). This will be Soriano’s Legacy Fighting MMA debut. He recently made his pro kickboxing debut at Legacy Kickboxing 3, where he was victorious.